Can we kill the church? It is no secret that Christianity in Europe and North America is in decline, at least in terms of numbers, attendance, budgets and societal influence. Christian leaders in the United States, in particular, are really starting to name and deal with this reality more and more. What many Americans may not know, is that Canada is about 20 years ahead in this process, and the UK 20 years ahead of Canada. In a way, I am speaking from the future of American Christianity, if things continue on the same path of decline. 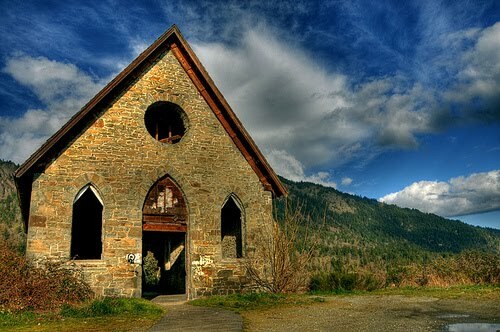 There have been a number of articles and/or sermons, making their way across social media, exploring the “Dying Church.” Sojourners (sojo.net) has recently run a series called “Letters to a Dying Church.” Mark Sandlin’s letter, in particular, articulates the decline of the influential church of the middle 20th Century that rested at the centre of western society. Mark describes a church that has moved into a fringe community that exists in the largely forgotten margins. The letter also articulates great hope in dying, and promise in God’s resurrecting work. Meanwhile, while Sojourners was running their series, Nadia Bolz-Weber published a sermon entitled, “Stop Saying the Church is Dying.” Her sermon also articulates the distinction between the social-cultural church of influence, which is in decline, versus the church that proclaims the Gospel, administers the sacraments and declares forgiveness of sins. While her title provocatively suggests the opposite of the Sojourners series, the point is largely the same. So, we all know that Christendom or imperial Christianity is losing ground and is, by all economic and social measures, dying. And we all know that the Church – that is primarily concerned with announcing the Gospel, providing the sacraments, providing the Body of Christ a time and place to gather and reconciling creation with creator – is alive and well. But there is an aspect to all this dying talk that I find curious, if not troubling. It is hard to argue that the church isn’t dying or transforming from what it was a generation or two ago. However, I think there is a flaw in our diagnosis. I think there is no small amount of hubris in the notion that the church is dying and we are killing it. Consider the weight of this claim. In nearly 2000 years, the church has survived barely getting off the ground for 400 years, it survived being imperialized, spreading across the known world, going to war, reformations, counter-reformations, splits, scientific revolutions, the discovery of new worlds, nationalism, revival, charismatic movements and global wars. And while yes, the church is in decline by all social metrics and economic indicators like membership numbers, budgets and sociopolitical influence, do we really think that because current generations are more interested in iPhones, new age spirituality, worshipping God in sunsets and grocery shopping after kid’s soccer on Sunday mornings, that the church is going to die because of us. Now let me be clear like Mark Sandlin and Nadia Bolz-Weber were clear, the Church, as the body of Christ, the spirit-led community tasked with proclaiming the gospel, administering the sacraments and declaring forgiveness of sins will continue to exist long after the structures of imperial Christianity are gone, long after the institution is gone. But even that claim misses the point. When I hear Christians talk about this institution-less, egalitarian, consensus church to come, I think we are dreaming. I think we have forgotten the realities of human communities. I think we have forgotten that almost immediately after the Ascension, Christian communities started setting up structures and systems to govern church life. And over time, these institutions have grown, changed, become flawed, reformed, and declined. But they are necessary. Just like the rules of grammar that allow language to convey meaning, foster creativity and breed emotion, the structure, institution even, of the church allows the gospel to be preached, sacraments administered and forgiveness declared. 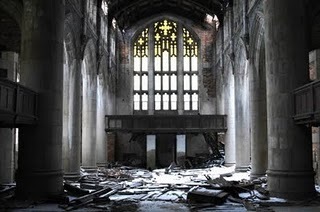 More importantly, the free, open, consensus based community that many Christians hope for in the midst of decline is a church that will cease to exist faster than our current iteration. Without structures to carry on our practice, everything that we believe would be forgotten in a generation. Even though the institution is guilty of oppression, violence, murder, war, discrimination and many other atrocities, the institution is also what carries the community through history. The institution bears the life of the community in a way that we time-bound humans cannot. The institution has preserved the good along side the perpetration of tremendous evil – a sinner/saint motif. All along the way, the institution has borne the witness of those who have gone before, whose words and music and art and actions are worth remembering beyond the lifespan of their originators. The institution is imbedded in our doctrine, theology and liturgy. The church is one, holy, catholic and apostolic, not because human beings have kept is so, but because in the traditions, structure and institution those four marks have somehow remained, by the guidance of the Holy Spirit. So what does this mean for our declining church? As much as many of us would like, we are not headed to a Christianity without buildings, budgets, and constitutions. We won’t get far without hierarchies, structures and systems. We will always need pastors, leaders and teachers. We even need, dare I say, bishops. Here is the thing, we can’t all preach and nor can we all listen. There will always be some doing one and some doing the other – that is structure. So yeah, our current version of the institutional church will probably continue to decline, at least for a while. But church has never really successfully changed itself… rather the world has changed around it. In in 1950s, the church did nothing to create a society in desperate need of an institution to rely on, to find hope in, to experience reconciliation with. Decline has mostly happened to us as the Church today, and before we can adapt to that, our world will change again. In fact, as economic inequality grows, as conflict looms in the Middle East and Eastern Europe, as the environment faces crisis, as nations and economies become increasingly globalized, I don’t think it will be long until people start looking for organized communities and institutional structures that proclaim the gospel, administer the sacraments, and declare the forgiveness of sins. Before we can do ourselves in, the world will need us again… in fact, the world needs us now. So, can we really kill the church? 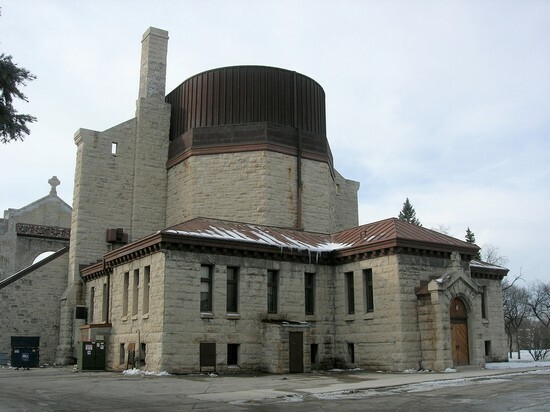 The Featured Photo at the top of this post is the burned down St. Boniface Cathedral in Winnipeg – this is the new rebuilt one.